This is a story about rugs and goats and friendship. I met Lee Ann about 10 years ago. You see, I had gone to the Michigan State Fair with my two young sons and had seen a pen of curious bright-eyed goats. And instantly fell in love with them. I went home and told my husband that I wanted to get some goats!!! He is the more practical one in this family and reminded me that I knew absolutely NOTHING about raising goats. As luck would have it, several months later an article appeared on the front page of our community newspaper. A local veterinarian was teaching goat care classes. "If you ever hope to own a goat," my husband said, "you'd better sign up for those classes." I wonder now if he was thinking that I'd take the classes and change my mind, maybe thinking it was too much work. The classes were once a month on a Saturday for nine months. Each month had a different topic related to goat care, such as vaccinations, feeding, housing, pregnancy, etc. I was the only one attending who didn't own a goat...and I went to every single class and took notes. Oh, and guess what? The teacher/veterinarian was Lee Ann. She is a goat-expert and I learned so much. I got my first three goats shortly after the classes ended. Now let's speed ahead about 10 years. I ran into Lee Ann again at the Michigan Fiber Festival and she told me that she'd like to try her hand at rug hooking. So this January when I started some classes here at my home, Lee Ann signed up. She watched and asked questions the first day but didn't want to sit and hook. "I just want to watch" she said. In the back of my mind, I was a little worried...everyone else was jumping right into it. Lee Ann bought some linen and wool and said she was going to go home and draw her own pattern. The rug pictured at the beginning of my post is Lee Ann's first rug! It portrays her mom's crazy energetic dog chasing a butterfly. Isn't it fabulous! You can just feel the happiness and energy in this rug! Lee Ann is smitten with rug hooking and she's having fun and I am so excited for her! The best compliment I can ever receive as a teacher is an excited and motivated student. This first rug has some sculpted flowers and beading around the border...just awesome for a first rug! And she's already dreaming of designing the next rug....a goat with prodded sunflowers. Don't get me wrong...I am extremely proud of ALL my students! They always work and progress beyond my wildest expectations. But I think this particular story is so special. 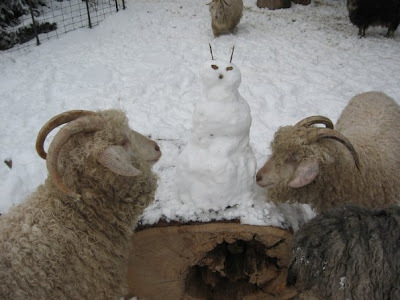 A spirit of sharing our passion of goats and rug hooking with each other. It doesn't get better than that. 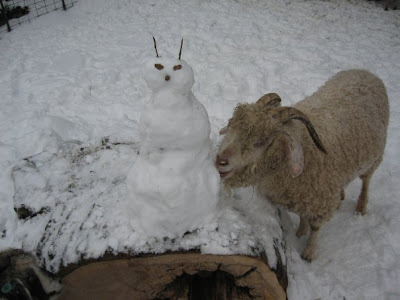 My son ventured out in the snow on Monday afternoon to shovel the driveway and play with the goats. I thought these pictures he snapped were really adorable! 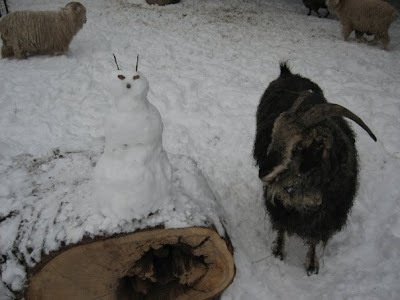 He made a little "snow goat" (note the stick "horns") and placed it on the goat's play-stump. Sequoia is examining it carefully. Zion decides that he ought to taste it......umm, umm, good! 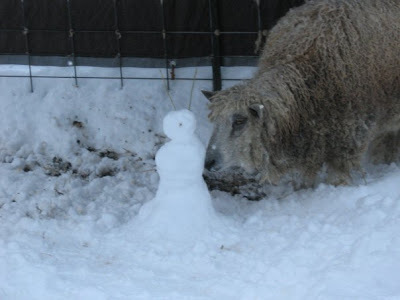 Emma got a little snow sheep of her own. I think she likes it! Not your typical fiber farm but at least the animals are happy (and just a little spoiled)! Quite often at this time of year, I get caught up in the zeal and enthusiasm of rug hooking. This year the Olympics has had me glued to my rug hooking chair. I am often working on one particular object with glorious abandon, caught up in the moment of it all. This is when I have to remind myself of a basic truth...step away from the rug! You see, we are often hooking and focusing our attention on one small area and not stepping back to look at the big picture. Sometimes this sets us up for surprises. I usually pull my work-in-progress off of my frame for the night, and then spread it on the floor in the morning to see what's going on. There are several reasons why I do this. First of all, I pull my rug off the frame so it is not tight and stretched out all night. 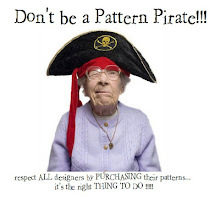 I learned this lesson the hard way on one of my early rugs as I had near-permanent "bends" and ripples from keeping it tight on my frame for days (or maybe weeks). The good news is that I did get it all steamed out to lay flat but it was quite a job! Now secondly, I do not look at my work until the morning because: A) I am a night owl and hook late into the night; B) if I'm tired and see something wrong before I go to bed, it will keep me awake thinking about how to fix it (you know you'd do the same thing! ); C) a fresh eye and fresh mind in the morning can problem-solve much better if something needs to be tweaked. You've probably noticed that I used quilling again. I've done a lot of that lately and wasn't sure I wanted to repeat it in yet another rug. But the rabbit's dress was so plain and I think the quilling buttons added just the right touch of whimsy. Sometimes these rugs tell us what they want to be! This is my finished rug "Have Ye Any Wool." If you remember from a couple of posts ago, I was frantically trying to finish my rug before I left for Mississippi to teach the workshop at P Is For Primitive. Well, I'm happy to say that I managed to get it done the night before I left. Maybe I just work better under pressure! I added the little hit-or-miss corners at the last minute. They weren't drawn on the pattern but I think I like the way it turned out...adds a little extra color up at the top of the rug and gives your eye a place to rest up there. Here's the orange goat with quilling circles. Even though I used a texture for the body, the little circles just added a little more dimension and interest to the goat. The horns were hooked as a single piece of #8.5 cut. I am pleased with the way they turned out. I hooked my sheep with roving. It is very special roving because it is from my beloved sheep Mikko, whom we lost almost 2 years ago. His wool was more of an oatmeal color and I love the way this little tribute to him turned out (If you want to read about Mikko, check out my blog post...but beware! it still brings tears to my eyes to read it). OK! On to a more festive subject....the workshop! Here are a couple of pictures of the happy hookers. I love these next two pictures because it shows all the flurry of activity and all the creative hands busy at work! This is Mary and Abby, just two of the happiest gals you'd ever want to meet. This is Deb. She did more hooking and just a little less talking than everyone else...and it shows! Look at how much hooking she got done! Brenna was adding quilling circles to her sheep. Candi had just completed hooking her "old goat." Chris gave her sheep a blue-gray face, and while it is a little hard to see by the picture, it was looking absolutely terrific! Deborah had gotten some of her letters hooked in. Her letter-hooking was very neat and tidy! Also love the yellow-gold star. Jane had also gotten quite a bit hooked before she had to leave. Don't you absolutely love the happy little face on Linda's sheep? I love Windie's gray goat....and don't let Windie fool you....this was probably the only minute that she had a straight face! There was a lot of laughter coming from her corner of the room! Patricia was hooking Emma's Garden. She is fairly new to rug hooking but you'd never be able to guess that from her rug! She was really rolling along and got a lot done! Margaret chose to hook Lion and Lamb. She did quilling on her little sheep and the lion's mane was coming along beautifully. Carol was hooking Home Sweet Home. She did quilling in the inside of the "O" in Home. And finally, Sue was hooking Merry Christmastime. This is one terrific rug. Don't you love the candy cane "C"??? Thank you to Lisanne Miller at P Is For Primitive and all the workshop participants! It was a wonderful and productive week!